IK Multimedia iRig Mic Field: it's a rotator! 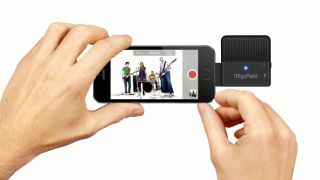 IK Multimedia has announced a new clip-on mic for Lightning-equipped iOS devices: the iRig Mic Field. Designed not only for audio recording but also for adding "Hollywood-style" soundtracks to your videos, this features a pair of cardioid electret condenser capsules, a 24-bit A/D converter (with 44.1/48kHz sample rate), 115 dB maximum SPL rating and a built-in preamp. IK says that the iRig Mic Field's suitability for video stems from its patent-pending design. It can be rotated through 90 degrees and locked in one of two positions, the theory being that you can optimise it for both landscape and portrait recording. IK claims that other clip-on mobile mics only deliver true stereo sound when the phone is used in portrait mode. Other features include a thumbwheel gain control, an audio-out jack for real-time headphone monitoring (usable with app support), and a multicolour audio input level indicator for visual monitoring. iRig Mic Field will be available in October priced at $99.99/€79.99. Full spec details are available on the IK Multimedia website.